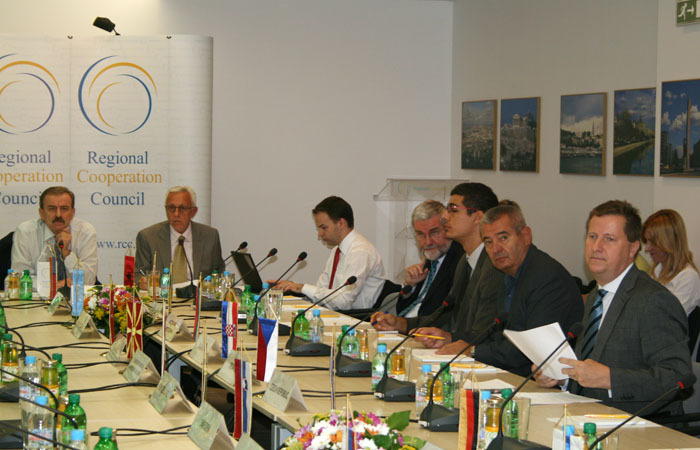 The 28-member Board of the Regional Cooperation Council (RCC) met in Sarajevo today, to review activities of the past trimester and set course for the work of the organization until the end of the year. Secretary General of the organization, Hido Biscevic, reported to the Board on details of implementation of the RCC Strategy and Work Programme 2011-2013. "Regardless of oscilations in political and socio-economic conditions in South East Europe, the region has continued to move forward", said Biscevic. "It is now entering a phase where regional cooperation and ownership need to move towards an all-inclusive regional responsibility." "One of key instruments in this effort should be the focus on large-scale regional projects, which is what the RCC is advocating for, through its activities in economic and social development, infrastructure and energy, justice and home affairs, security cooperation, building human capital and parliamentary cooperation." Secretary General Biscevic highlighted a successful implementation of the Regional Strategic Document and Action Plan on Justice and Home Affairs, adopted this year; establishment of the Secretariat of the RCC Task Force on Culture and Society; and transfer of the Organisation for Economic Co-operation and Development (OECD)'s South East European Investment Committee to the RCC, expected to begin by the end of the year. He also shared information on the coordination of activities between the South-East European Cooperation Process (SEECP) Troika (Montenegro, Serbia and the Former Yugoslav Republic of Macedonia) and the RCC Secretariat.